Shop Hosa ProConex Little Bro' Sub Snakes Xlr x 8 from AMS with 0% Interest Payment Plans and Free Shipping. The Hosa Pro Conex Little Bro Snake is a compact, pro-quality snake. 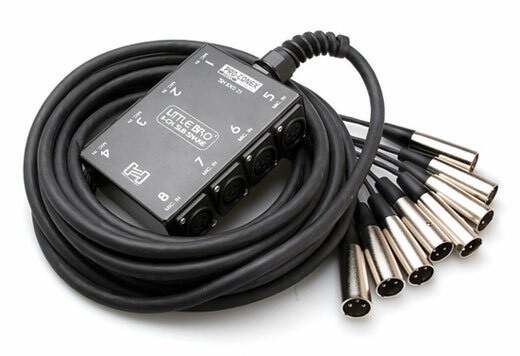 Perfect for the stage or studio, this snake provides 8 XLR channels with no returns. One simple connection to hook up 8 XLR balance lines to your mixer or recorder. I’ve used it on a few mobile recording sessions and it works perfectly! Highly recommended. This is exactly what I needed; small size, light weight, and it's very well constructed. Bought this for my small home studio, I am currently using it on my drum kit. I am very pleased with the quality and it helps me the cables organized and neat. Rugged. Made well. Very pleased with performance. Get 2, much better than a single 16 channel. I own a Production Company with multiple crews and have several of these snakes in various lengths and configurations (8x0-25',8x0-50', 6x2-30'). Da' Crew uses them every show. We drop one up-stage and one down-stage this way it keeps the stage area clear of our wires.